"You know what I said? That's right. That's what I said!" Although Gildersleeve did his best to be both father and mother to Leroy and Marjorie, the household was not without a strong feminine influence, as well as someone to help put Gildy in his place. Birdie Lee Coggins had been the cook and maid in the Forrester household before Gildy arrived, and she helped to raise the kids. Birdie was feistier than many African American domestics on the radio, and was loved for it. She often kept her employers pomposity; often by repeating herself ("You know what I said? That's right. That's what I said!") Her nights off were spent at her lodge, "the Mysterious and Bewildering Order of the Daughters of Cleopatra, of which I is the Head Sphinx!" Birdie was a stereotypical black character, but Lillian Randolph played her with life and joy. She was never afraid to contradict her boss, and more often than not actually got in the last word. The younger sister of actress Amanda Randolph, Lillian was born in Knoxville, TN, in 1898, the daughter of a Methodist minister and teacher. Her professional singing career began in local radio in Cleveland and Detroit. In 1936 she moved to Hollywood for work on Al Jolson's radio show and to sing at Club Alabam. Along with her sister Amanda she struggled to find work in order to make ends meet. Randolph landed the role of Birdie thanks to her ready laugh. The story goes that when she heard the Gildersleeve show was being cast, she made a dash for the NBC Studios. Tearing down the halls, she burst through the door for the Gildersleeve program- and fell on her face! She wasn't hurt by the fall, and managed to stand up laughing, which won her the role. Her best remembered film role is as Annie the Maid in Frank Capra's It's A Wonderful Life. More significant is her uncredited voice-over work as the maid, Mammy Two Shoes, in several Tom and Jerry cartoon shorts. Randolph drew criticism from the African American community and the NAACP for her portrayal of stereotypical black domestics. 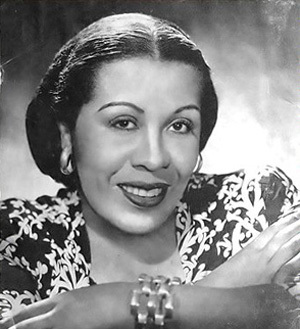 In 1946 Ebony published an article critical of her role as Birdie. She and Gildersleeve writer Sam Moore published a rebuttal wherein Randolph defended her roles, reminding readers that the writers had never written dialect into the script, and were particularly careful not to offend their black audience. She reasoned that the roles would not be discounted, but that the ethnicity of those in them would change. Lillian Randolph is buried in Forest Lawn Memorial Park. Her sister Amanda rests beside her.